SSH is one of the most important tools I use. It has tons of cool features for the power user. First off any serious use needs SSH keys and ssh-agent to go with that. Socks proxy forwarding is super powerful, as is SSH mutlihop. GitHub works nicely with SSH, and Ansible builds on SSH. And when you use Ansible, you probably want to throw in . . . There are tons of information about the technical stuff you need to do when . . . I usually write an upgrade report on our OpenStack version upgrades. We recently upgraded from Juno to Liberty. I haven't gotten to writing how it went, partly because it went so smoothly. Disclaimer: The preparation and work behind this was mostly done by others than yours truly. Architecture-wise we still run monolithic . . .
We run a lot of servers. Sometimes they break, and you have to involve the vendor. I thought I'd write about a severe security issue with the support cases. This is probably well known for most people dealing with vendors, but I don't think there's been enough discussion about it. Let's say you . . .
What we basically want to do is provide high IOPS capable temporary data processing VMs. On the hardware . . .
Let's just jump right into it. We have a small scheduling problem in OpenStack Nova. To understand it, let's explain . . .
And Bessie the friendly cow, and that ratty cat you never really liked. I have been thinking a lot about cattle and pets lately (in the IT sense). If you are not aware of the concept, it's something that Randy Bias (from EMC/Cloudscaling) coined and the admins at CERN made popular. 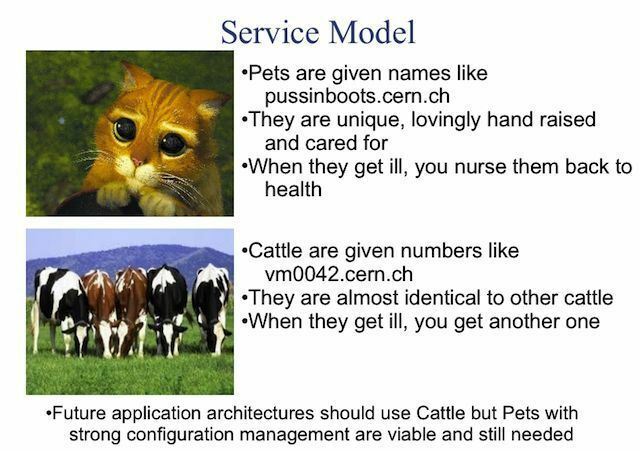 It basically says, you can treat your servers like pets or like cattle. It's a great simple way to think . . .